Location: Lower Loop Road 2.5 miles east of the Old Faithful Overpass. Hiking Distance and Time: The trail is 4.7 miles round trip. Plan your hike to take 2-5 hours. The total length will depend on how long you have to wait for the geyser to erupt.. In the summer of 2017 I received a job with Xanterra Parks and Resorts in Yellowstone National Park. I moved there with my husband and our four young children. We lived in a 25 foot RV and spent all our free time exploring the park. 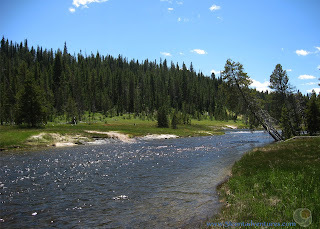 This is the first of many posts that I will write about specific features within Yellowstone National Park. At first these aren't going to be in any particular order, but in a few months I'll start grouping them into lists. This one would probably fit into a list such as "Best back country hikes for beginners" or something like that. 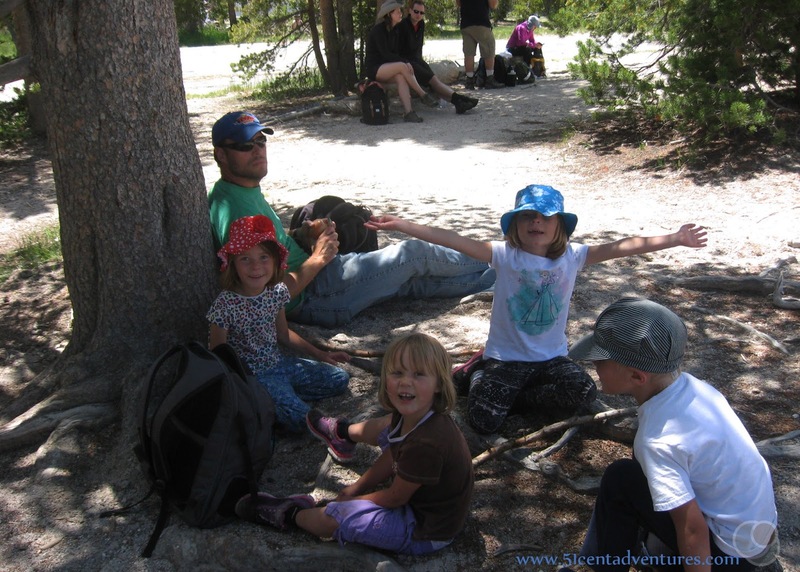 We had been living in Yellowstone for a little over a month when my husband and I decided it was time to take the kids on a hike to Lone Star Geyser. This had been on my list of things to do since we first moved to the park, but the trail had been closed until about the second week of June. A lot of the trails in the park are closed until the middle of June because of bears in the area and/or too much snow on the ground. 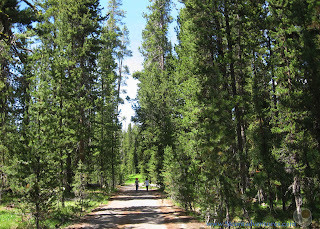 So we'd spend our first month in Yellowstone mostly exploring boardwalk areas. But now it was time to start visiting more of the back country. 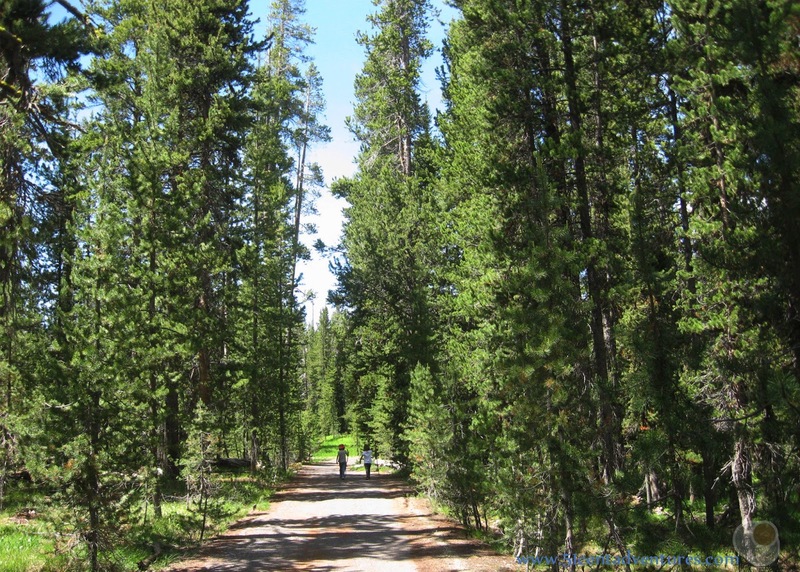 The trail head for the hike is located about 2.5 miles from the Old Faithful turn off on the lower loop of the Grand Loop Road. It is just a few yards east of the turn off for the Kepler Cascades. The parking area can hold approximately 30 cars so it's fairly large for a trail-head parking lot. However, be aware that during peek tourist times this parking area could fill up quickly. So it's probably best to plan to start your hike before 10:00 am. The trail is actually an old park road. It's closed to vehicle traffic, but is open to bikers and hikers. It's wide, fairly level, and paved most of the way. 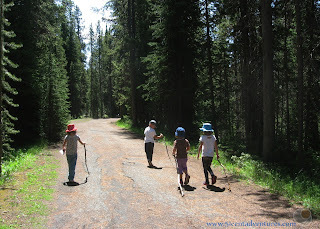 This was especially nice when our kids picked up hiking sticks like they did on every hike. I have a love/hate relationship with hiking sticks. Several years ago Bunmi Laditan wrote a wonderful essay titled "I'm Done Making my Kid's Childhood Magical." She writes that childhood is inherently magical. One example she offered was that walking with a branch is magical. I always think about that when my children happily pick up sticks and drag them around as we hike. The only problem is that on narrow trails my husband and I always seemed to trip over our kids hiking sticks. Or the kids fight over who got the best stick. You can't imagine how many arguments we've had about sticks while we've hiked. So I was very happy that this trail was wide enough that the sticks weren't in anyone's way. 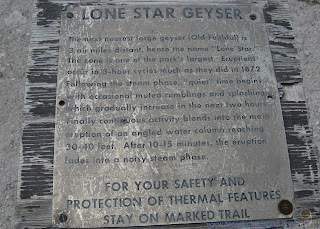 The trail is 2.4 miles from the parking lot to Lone Star Geyser. 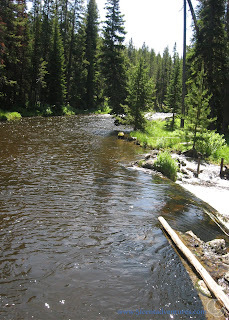 It follows the Firehole River most of the way. It's a mostly flat trail that I would call easy though there are some gentle inclines. It took our kids roughly two hours to hike the whole way. As we walked we passed people who were hiking back from the geyser. They told us the time of the last eruption. That helped us gauge whether or not we needed to hurry. The trail was shaded by pine trees, and so even though we were hiking in the early afternoon we didn't get too hot. Still we were very happy when the trail opened up into a clearing, and we could see the large geyser cone. A plaque told us what to expect. There was also a small box that held a book where people were encouraged to note the time of the last eruption. Lone Star Geyser consistently erupts about every 3 hours so we had a good idea of when we could expect the next eruption. 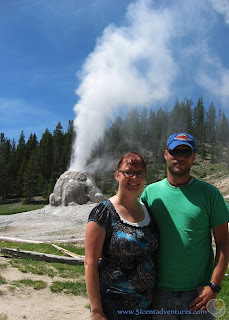 We were there at about 1:45 and the book said the geyser would erupt around 2:35. We had about an hour to wait. Fortunately we were prepared for that. 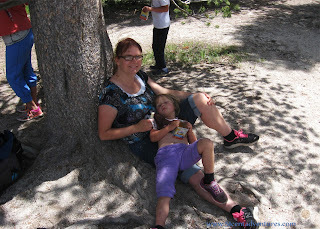 We found a shady spot and had our lunch. There were approximately 40 other people waiting with us. 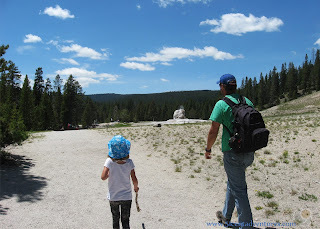 The kids got restless so we went on a little walk down to the Firehole River. 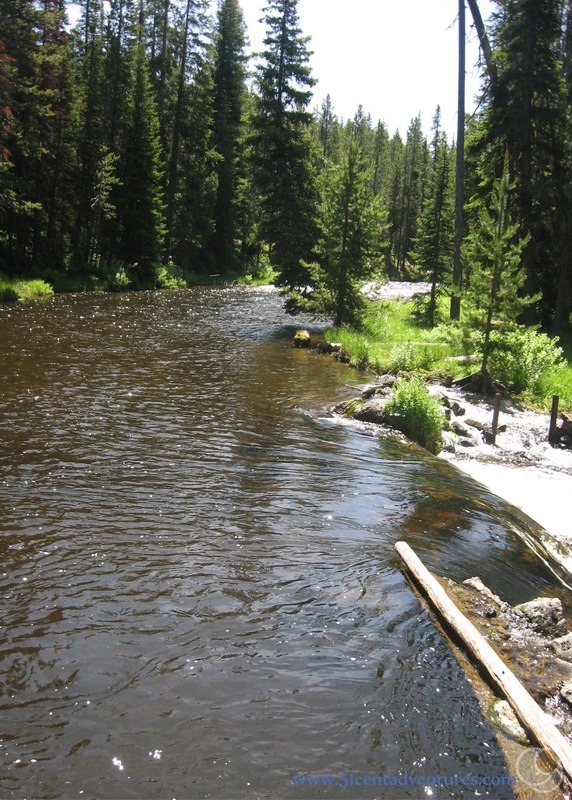 The run off from Lone Start Geyser is some of the first geyser water to reach the Firehole River. Farther down stream this river flows through some of the most active geyser basins in the park. But up here, the scenery was much more calm. Around 2:00 We heard lots of excited cheering and so we ran back up to the geyser. Steam and water was starting to spurt out of the cone. This lasted only a short time. According to our guidebook, Day Hikes of Yellowstone National Park: Map Guide by Jake Bramante, this was one of many false alarms. The true eruption would come at the scheduled time. So it was back to waiting around. At almost exactly 2:35 our patience was rewarded. 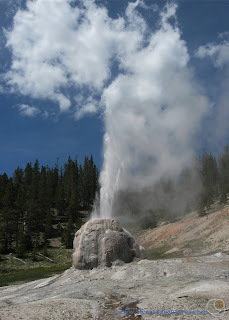 The geyser started erupting and shooting out large amounts of water and steam. This lasted for 20 or so minutes. 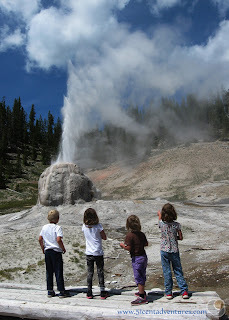 I love this picture of the kids all standing in front of the geyser. 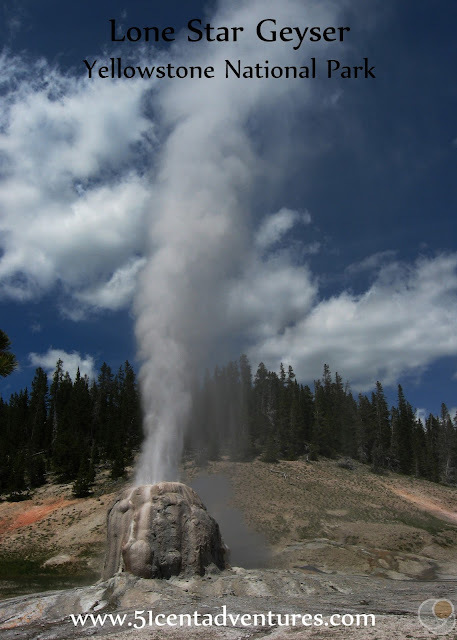 They'd thought the geyser was named, "Lonely Geyser." After this the twins told me they should rename it "Friendly Geyser" since it put on such a good show for everyone that came to visit. And here's a picture of my husband and me in front. After the eruption ended we marked the time in the log book and then started back down the trail with the other people who had watched the eruption. We made sure to tell the people we passed the time of the last eruption. This had been the longest hike the kids had gone on yet, but they did great. Thanks to the success of this hike we would start venturing farther into the back-country in the coming weeks. 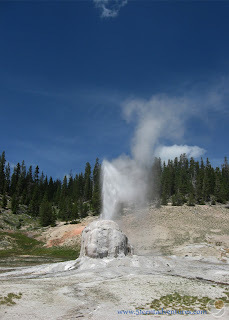 Recommendation: This is a great little side trip for visitors who want to view a geyser from a less crowded area. Not every visitor has time to spend hiking to this geyser, but those who do will be well rewarded. Plan for this to take up anywhere from 2 to 5 hours of your day. Directions: The trail head for Lone Star Geyser is located on the lower loop of the Grand Loop road. (It's basically at the bottom of the figure eight.) 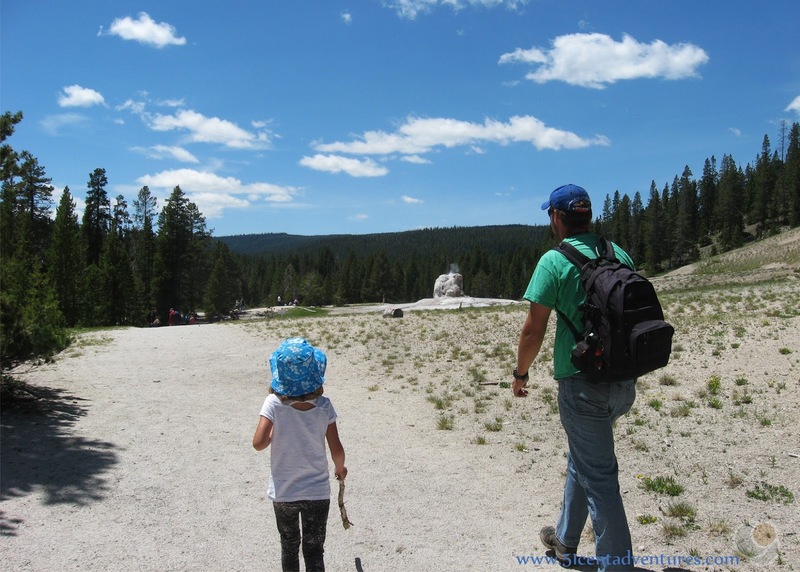 There is a hiking trail from the Old Faithful area to Lone Star Geyser, but that trail is much longer than the one my family hiked on. 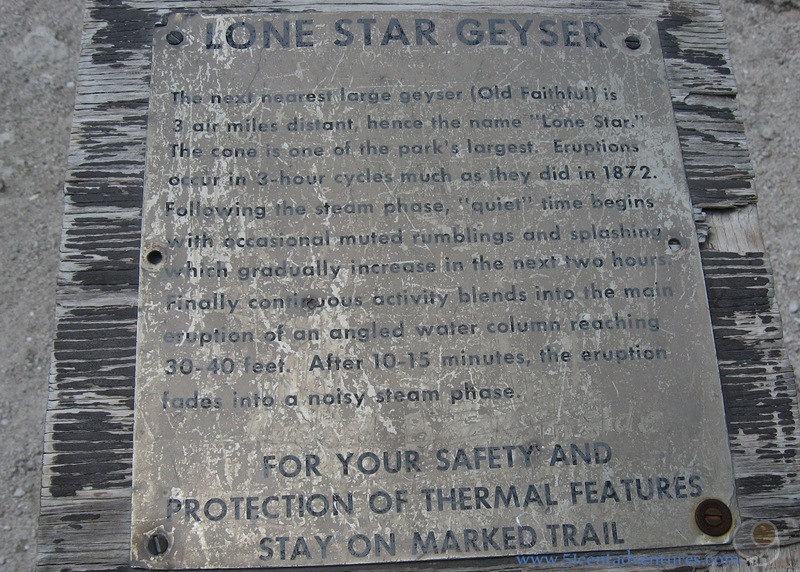 The official Lone Star Geyser trail head is about 2.5 miles east of the Old Faithful overpass. Places Nearby: The Kepler Cascades are within a few yards of the Lone Star Geyser trail head. This is where the Firehole river runs down a rock face and through a narrow canyon. The viewing area gives you a good look up and down the canyon. It's definitely worth your time to walk over there from the Lone Star Geyser parking lot. Next Stop: If you head west your next stop will be the Old Faithful area. 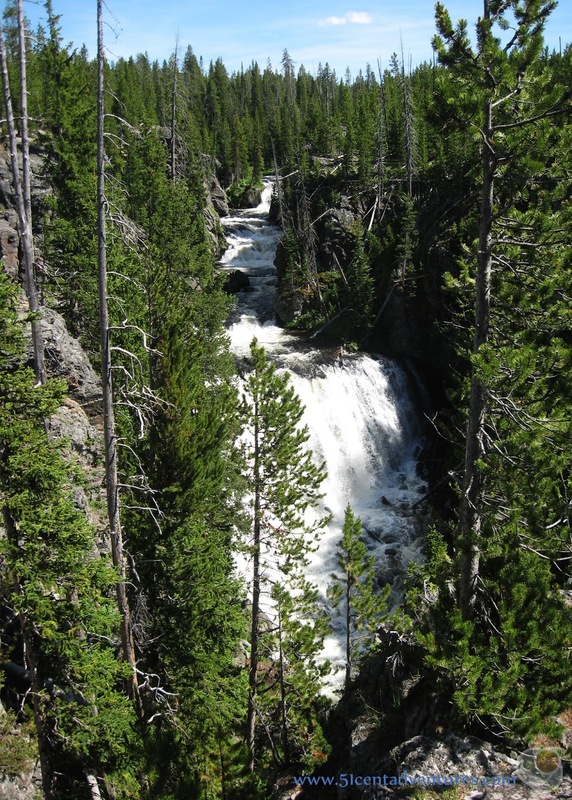 This is a great place to see many, many hydro-thermal features of the park. You can also take a minute to relax in the visitor center, buy some souvenirs, or get a meal at one of the restaurants. If you head east your next stop will be the West Thumb Geyser basin. 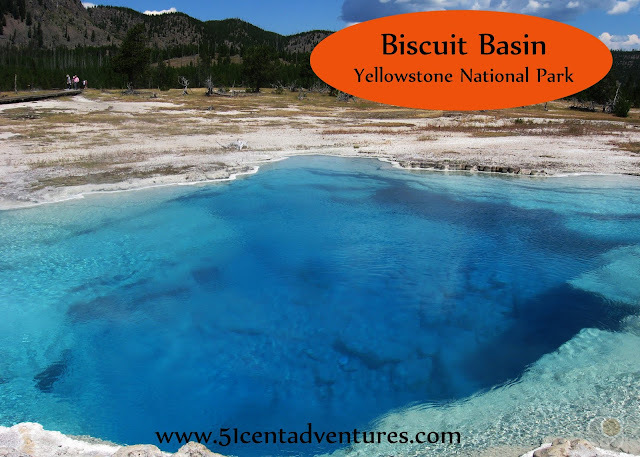 This area has many beautiful hot springs located on the picturesque shore of Yellowstone Lake.